I give you all that I own if you can show me just ONE undoctored picture of earth as a BALL from 'space'. God-the Lord JESUS created the earth round and flat, with a firmament. Outside the firmamant/dome/vault is water, just as the Bible says. Hans S Of course..That's why they put Rings around it.To keep it from wandering off! mic dhen, it's clear you're mocking the God-made flat earth truth and I've never done that in public when I was still a deluded globe earther, though I thought that flat earthers are insane. They're not insane and all flat earthers are former globe earthers and they will never go back to that stupid globe earth lie concocted by satan and the Vatican. So you don't want my MONEY? Concerning this topic you reason exactly like the ATHEISTS I confronted after I had become a flat earth truther. Try to convince JESUS Christ that the earth He made is a BALL, okay? Hans S Thx, but I've already got too much stuff I've got to unload. Want to downsize. Rapture ready...can't take it with us anyways. But thx. Also, I have no pictures of Earth from space. I've never been that far out. (Okay, some might debate that.) Let me re-phrase that. Barring some weird 'adventures' long ago that I don't recommend to others, and am grateful Jesus forgave, rescued, and delivered me from, (many times shame on me), I've never been that far out. Especially not with a camera. So, no pics. Renee, I was a globe/ball earther most of my life and when I was 56, on October 1, 2016, I became a globe earther and I was already saved forever by JESUS's Grace through faith alone in His atoning BLOOD. You fight for the gospel and me too and I also fight for the truth, because JESUS is the truth. He showed me the truth about the true shape of the earth and He had already convinced me in 2013 that the earth doesn't spin and that it's the center of His creation and NOT the sun. You assert the Bible easily supports the globe earth and heliocentrism and I know people who got convinced that the earth is flat by reading that same Bible. So now the question is: is there a 'globe earth Jesus' and a 'flat earth Jesus' and do they disagree? I know someone who got saved from suicide after he first discovered the flat earth truth. According to you he first believed in a lie in his desperation and from there he got saved...or is he still going to burn forever in hell? I give you all my money if you can show me just one undoctered picture of the earth as a BALL from 'space'. Is it possible to believe in the gospel of grace and still be deceived? I was deceived when I believed in the globe earth nonsense when I was already saved. Your sense of humor will be tested when you realize WHY satan concocted the GLOBE EARTH LIE! You really did your best to try to impress me by using your OWN language to a Dutchman, or shall I now continue in Dutch to show my sense of humor? Dat kan ik uiteraard doen, maar dat doe ik niet: Of course I can do that but I don't. Thanks for your long reply, which shows you have pondered about it. James is only 10 years old and he's already been brainwashed by the globe earth lie, which also happened to me (and BILLIONS of others) when I was a child through the 'educational' (mind control) system. The globe earth lie is pure SATANISM! I'm so GLAD that JESUS and NOT anybody else showed me the flat earth truth, even though it's not about eternal salvation. You know why satan=adversary is so successful? Because it's so EASY to DECEIVE people! If he can make them believe the earth is a BALL, he can control them and they don't even know it. So many believers in JESUS believe in the TRUTH=JESUS while at the same time they're preaching and teaching lies, and most of them aren't even aware. To answer your question: I believe that outside the flat earth system there's WATER as far as the eye can see and it's neither curved nor flat and I believe we live in a HUGE 'submarine' which is moving 'upward' so that we get that sense of 'gravity'. 35 Nor yet by the earth, for it is his FOOTSTOOL: neither by Jerusalem: for it is the city of the great King. 36 Neither shalt thou swear by thine head, because thou canst not make one hair white or black. Hans S Wrong again, Flatso. Look, Hans, I don't want to fight w you, brother. I didn't then and I don't now. I'm a saved believer in Jesus, you claim to be, too. Great! That makes us bros in Christ...by HIS grace and HIS decision, not anything WE did, so keep that in mind, ok? I made a joke for my friends, Renee and JimJim. That10yr old lad is smart enough to know the Earth is round. He has also had intelligent conversations AND good-natured ribbing with FEers, as have I. Sadly, there only seems to be a few ppl that are FEers that can also kid around, and not get all snotty about it when someone thinks they're nuts. It's called having a sense of humor and not taking yourself too seriously. One is a very sweet sister and intelligent Bible believer, she's a saved believer in Jesus, believes in pre-trib rapture (properly, imo) and has a heart for the truth. She supports Renee's osas, grace alone, biblically true position. She's one of our many beautiful sisters in Christ, her initials are VS. She also believes in the FlatEarth theory, so she's a nutso! Another one has a very thought provoking channel, hosts some very intersting livestreams, and ALSO believes in Jesus and the truth of salvation by grace thru faith in Jesus Christ alone, so is a brother in Christ. He happens to be post-trib (I think), and is a FEer as well, so he's a DOUBLE nutso. ����His initials are MV. You might know him. Btw, where are all the undoctored pictures from space of a FLAT Earth? And you still haven't answered the Q about the water in or above the dome ... Is it flat or curved? God bless you, brother. And relax, the Bible says (if you can believe it...the Mandelites say you can't) that God is gonna make a new Heaven and Earth. The old one will burn away, or something like that. Then I guess, when the old rock is burning, the shape of it won't seem as important. If someone tries to prophesy to you that they know the shape of the new earth in advance...? 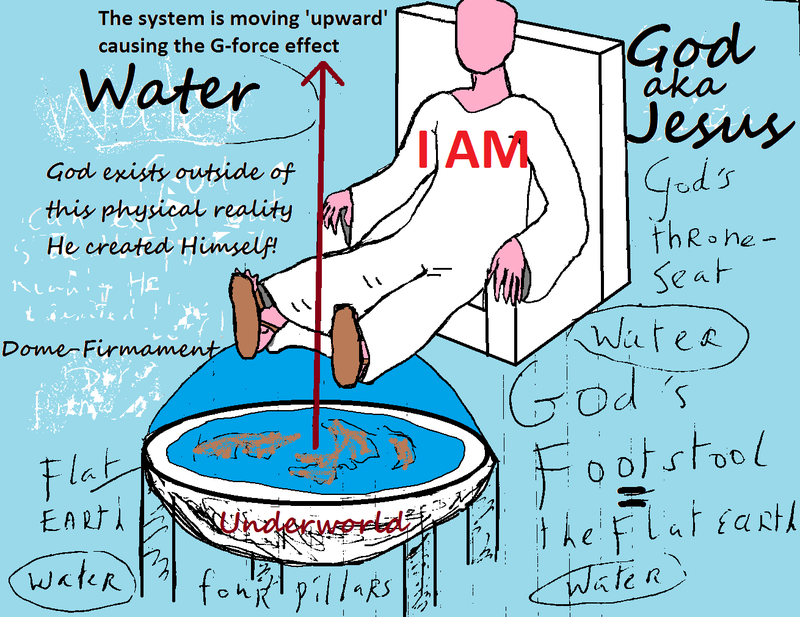 You don't get it: God-the Lord JESUS isn't dependent upon the laws of physics he created Himself and He's ABOVE all laws we're subjected to and that's why He could walk upon water! So when the flat and round earth with a firmament moves 'upward' He's not feeling it because He's NOT a human being of flesh and blood but GOD! 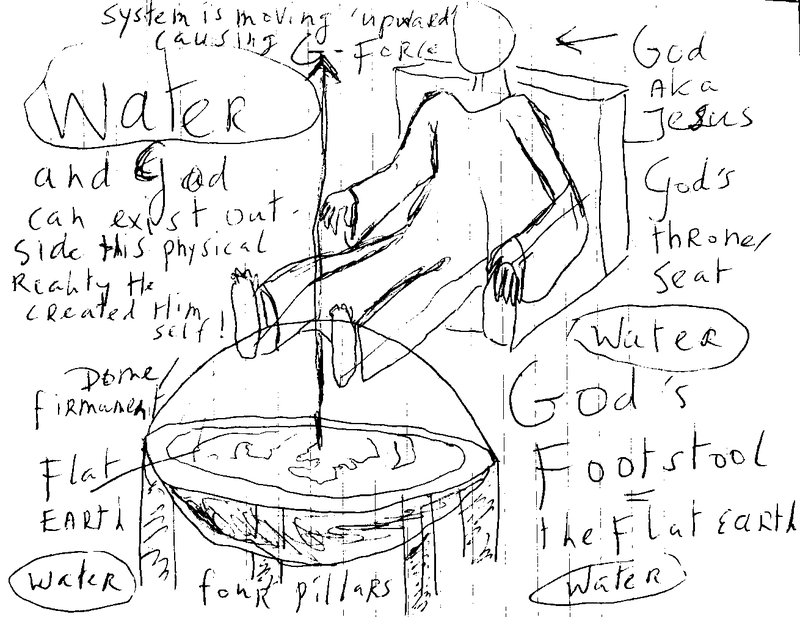 He made the firmament big enough so that His feet can rest on it, even though it's round, but not too round. Okay, Flatsum, I take it back...You've got a GREAT sense of humor! But seriously 😃 it might be therapeutic. It might be stimulating, and could get kind of tingly on His toes, plus, all the fast-spinning skyscrapers could help scrub the scaly bits off His heels. Followed by a nice foot-soaking in all the saltwater. God/Jesus is sitting on the throne of heaven. (Is this a fluffy throne like on the clouds? Or a hard white porcelain throne? Does it recline? And have pillows? (It IS heaven, you know, so it's gotta have comfy cushions and fluffy pillows!). Now, He has his feet up on the Earth for a footstool, right? Are His legs fully stretched out, or are His knees bent? In other words, are the soles of His feet flat down on the FlatEarth? Or are His heels on the FlatEarth, with His toesies sticking up? They can't be up on the dome, because that would be ... round? And they would slip off, right? Isn't that what you were implying? He can't have His feet on a round footstool, so the Earth MUST be flat? So His feet are on the flatstool, which is like an ever-rising (up?) yellow submarine we all live in. And we should assume the throne of heaven is rising upward, too, otherwise, only His feet would be going up, up, up and WOAH! WHEE! FLIPSIES!! Can't have that! Praise the Lord...A merry heart doeth good like a medicine 😃! God bless you, brother! Jesus loves you! Before I believed in the flat earth truth and before I believed in OSAS I was called WORSE THAN SATAN by a 'friendly and kind' OSAS-adherent with a 'good sense of humor'. Rob Skiba is SAVED and he's MY brother in Christ JESUS, but your jesus doesn't know this and he dislikes the flat earth REALITY..
All convinced globe earthers who refuse to investigate GOD's flat earth truth are on the side of the Vatican, the Jesuits and NAZI-NASA and the devil concerning this subject. Hans S Lol, I get it just fine. I don't know any Rob Skiba or whether he's saved (a brother) or not. Mic, I am with you all the way on the MandelaCult. They nearly had me sucked in deep -- UNTIL I started reading the bible for myself and God showed me these verses and instances have always been there!!!!! For a long time I trolled them too. EYA (EXTOL YESHUA ALWAYS-- no she does not!!!) is a witch. I was in her secret facebook group for quite sometime and let me say shes a total deceiver on many fronts and aspects of our faith. You right about this brother. To twist and manipulate the words of God the way they do is downright blasphemous. Anyhow, there are many people out there actually PROVING earth is not a ball. Water exposes the global lie (and earth is mostly made of water). "You, sir, are an idiot" "Flatsy"
There's NO difference between you and atheists who desperately cling to their beloved JESUIT concocted LIES, concerning this issue. You're calling JESUS Christ, God manifested in the flesh an IDIOT, because He didn't make a satanic spinning ball in 'space' called earth, but a flat and round plane with a firmament. You're on the side of the Nazis who founded NASA, because they didn't lose the war, because they went to America, with the aid of the EVIL Vatican, which is the satanic Roman Empire. I already knew this before I became a flat earther. Wake up 'American', because you live in the most evil country that ever existed! Your country financed BOTH Hitler and Stalin on behalf of the POPE and Satan, causing MILLIONS of deaths and even more MILLIONS of traumatized people, like my late MOTHER when Hitler invaded my country. You dare to call me arrogant? Have you ever looked in the mirror? I AM A CITIZEN OF HEAVEN, thanks to JESUS! You are a PROUD AMERICAN, and proud Americans are VERY DANGEROUS, because they're MURDERING and MAIMING people all over the world, and all because they're too stupid to see that they're being used by the devil and his JESUITS and the Vatican. You may SLAUGHTER me or BURN ME ALIVE me if you can show me just ONE REAL picture of earth from 'space'. Yes there are no pictures from above of the flat and round earth and you know why? Because God made it IMPOSSIBLE to make such pictures!!! The STUPID ROCKETS that all 'aerospace countries' fire into the SKY, based on NAZI-technology can't get HIGH enough to make such pictures. You have been fooled by the devil and his Vatican! Hans S Oh why don't you shut up and get off your arrogant high horse with your false accusations! But you, Hans?! Your arrogant meanspiritedness has gone too far, and it's really disappointing! I was kidding around with my young christian friend, and you stuck your nastiness into it. Thanks for the good cheer, Flatsy. Calling me a devil or jesuit follower, is the same stinkin low blow I see vomitting out of the mouths of 90+% of FlatEarth peanutbrains like you. I told a joke, so what, big deal, to my young christian friend, who has more intelligence AND good cheer in his little finger than most FEers have in their warped heads. And BTW, Don't call my little brother brainwashed, you flatz. MAN, you're just another typical vicious flat rat, aren't ya? And telling me MY Jesus is somehow inferior to your god who's sitting on a fluffy throne with his feet propped up on an INVISIBLE CURVED DOME with CURVED WATER, overtop a Flat Earth that HAS to be flat because it's his footstool and his feet would fall off, even though NOW you say his feet aren't even on the 'flat earth', they're on the curved dome?! this scripture-twisting you appeal to, about God's heavenly throne and Earth being His LITERAL footstool is about as doofish as Hinn trying to tell us there are 3 Trinities in the Godhead! And YOU're gonna come on HERE and insult a young boy's intelligence?, and his mother as well? Hans...YOU are the one that said the Earth has to be FLAT because it's God's footstool. THEN you said His feet are actually on the CURVED dome part. Do you hear what you're saying?! Hans, I don't know who this Rob Skiba guru is you're following, but it sounds like he's manipulating people and messin' with their heads! I hope you get away from that, and just stand on the SOLID ROCK of Jesus Christ. I decide to be GRACEFUL to you. It's so EASY to respond FROM THE FLESH, but I'm as DEAD as a DODO, though JESUS raised me from the spiritual death! This is not your or my TERRITORY and the ENTIRE internet belongs to Satan and I love to ANNOY him whenever and wherever I can by talking about JESUS as much as I can. I did not insult Jim or Renee, and you're NOT their DADDY/HUSBAND! Yes, I believe you love JESUS Christ, but if you're truly detached from stupid NATIONALISM and PATRIOTISM and if you truly belong the the KINGDOM OF GOD then you MUST agree with JESUS and ME or your eternity will turn out to be a HELLISH experience, because I'm NOT going to BURN IN HELL FOR YOU to satisfy your GOD-COMPLEX! You'll have to KILL me first to 'prove' you're 'right' and I am 'wrong' and then you'll only do me a favor because then I'm with JESUS and then you have proven that your FLESH still loves to DOMINATE your MIND. Rob Skiba is NOT my 'guru' and in fact I discovered him later after I had become a flat earther, and I mostly agree with what he says, but not with everything because like so many people with a CHURCH-background, which I DON'T HAVE as a FORMER ATHEIST, he believes in the OCCULT GARBAGE called 'the book of Enoch'. Do you know I was kicked out of the 'Biblical Flat Earth community' on Google plus and do you know why? Because almost all of them believe in the WRONG GOSPEL and NOT in the gospel of GRACE. They almost tried to LYNCH me, so to speak, when I confronted them with their fallacy. Christians can be just as EVIL and ROTTEN as 'unbelievers', unless they're DEAD! ONLY DEAD PEOPLE DON'T SIN. They also don't do GOOD! But I'm not afraid to be BLOCKED and to be kicked out of communities of UNTRUSTWORTHY people, because JESUS is my BEST FRIEND! But in 2013 I was already convinced the earth is NOT spinning and that it's the CENTER of God's creation, and I already knew that the 'manned moon landings' were FAKE and that 'satellites' DON'T EXIST. You really don't know how ROTTEN and EVIL the JESUITS are! Hans S Yes I call you arrogant! You came on Renees channel after I made a simple friendly joke with her son. You took the fun out of it by immediately going into a serious 'FlatEarth' spiel. After a little more sarcastic needling, your nasty nose got snipped and you went for the generalizations and condemnations, all the while making ASININE statements about God LITERALLY sitting with His feet propped up on Earth! YOU made the claim that the Earth MUST be flat because it's God's footstool. Then you changed THAT scripture twisting, and decided His feet are actually resting on a dome! Those are YOUR twisted versions of scripture and strange view of God, imo. Yet, when challenged, you skip over your own claims and go on attacking me with false accusations, lumping me in with groups that I neither ascribe to, nor want to. but THAT WASNT GOOD ENOUGH FOR YOU! And you continue to falsely accuse me, even of siding with the Vatican and even satan???!!! You lying, false accusing *@#$! Ok, boy, you want to be a lowlife, go ahead. You are ANOTHER in a growing list of FEers who turns into a false accusing jackal as soon as you find someone who doesn't believe in your little pet flat earth theory. I've come across your type before, I doubt you'll be the last. It doesn't matter, the Lord Jesus Christ is my God and Saviour, and there's no more condemnation for those in Christ Jesus. So hurl your lies and false accusations all you want. You do not know me, you do not know what I believe regarding America, OR WW2, OR the RC/Vatican abominations, OR NASA. You simply make generalized, group assumptions and condemnations based on the fact that I think the FlatEarth theory is wrong, and that your silly TWISTING OF SCRIPTURE to try to prove it, is moronic! PLUS, you still haven't addressed your own contradictory claims, you skipped right over them to continue your diversionary attack with false accusations against me. YOU made the claims, Hans. YOU said the Earth had to be flat because it's God's footstool. Then YOU contradicted yourself and said His feet were on some invisible curved dome. YOU made those claims following what started as a playful joke with a young christian regarding OnionRings. And YOU, Hans, YOU, have yet to plainly address the claims you made, rather, you keep trying to shove your FE theory at others, shilling for others by posting link after link of other ppls channels... And doing it on RENEE'S channel, the same one where you insulted her son AND her! You've got some nerve, Hans! Her channel isnt for spewing nonsense by other flat earth profiteers and possible wolves. Her channel is about salvation in Jesus Christ, the gift of God. I'm checking your FE guru Skiba, but I'm not touching your links. I'm already suspicious about him...if he is who I think, I suggest you find another teacher...one about the gospel of grace, not law and flat earth theories. Believe in FE if you want, Hans, but not thru scriptorture, and because you follow after a possible false teacher. I'm suggesting that for your own sake, just suggesting. But if you come back at me with another false accusation and condemnation, you prove you're not interested in brotherhood in Christ, but only promoting your FE theory agenda while avoiding the earlier claims you made about God and scripture.